This month's FEI World Cup™ Vaulting Final will attract thousands of spectators in Dortmund and online viewers from across the world via FEI TV. While this thrilling sport - essentially gymnastics on horseback - has attracted a loyal global following since it was recognised by the FEI in 1983, its origins date back to ancient times. Vaulting consists of a horse cantering on the lunge on a 15-metre circle while either an individual, pair, (pas de deux) or team perform a series of set movements which illustrate their acrobatic and artistic skills. The first FEI World Cup™ Vaulting Final took place in 2011, but ahead of this year's event from March 22-25, let’s rewind to the discipline's origins. Artwork depicts Vaulting taking place in ancient Crete, although initially bulls rather than horses were used. Vaulting featured in the Roman Games dating back some 2,000 years when acrobatics and artistic riding was performed across the back of a moving horse. Vaulting has served a practical purpose throughout military history. It was considered a training tool to hone the skills of those fighting on horseback while holding a sword or weapon in one hand. Vaulting, or La Voltige, became fashionable across Italy and France during the Renaissance period of the 17th century. Noblemen showed off their agility on horseback and enjoyed it as much as they did fencing and wrestling. Around this time the celebrated German theologian Johannes Valentinus Andreae travelled to Italy and came across the sport. It’s said Herr Andreae was captivated not only by the beauty of the sport, but the strength and serenity the riders utilised. On returning to Germany, Herr Andreae opened a school devoted to the sport. Voltigieren, as it’s known in Germany, experienced a notably rise in popularity after the Second World War. Vaulting is considered a good discipline for young children to build up their confidence and skills while the horse is in walk. The horse is controlled by an adult on the end of the lunge line. Practice often takes place on a gymnastic vault or a barrel. The connection between equestrian Vaulting and gymnastics is clear to see. The riders also wear simple clothing, a single, figure hugging, one-piece garment, which ends at the ankle and wrists akin to the outfits of acrobats and gymnasts. 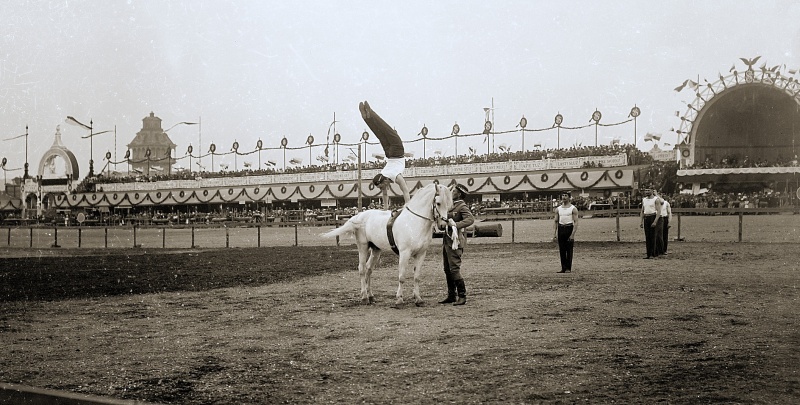 Vaulting has only been contested in one Olympics which was the 1920 Antwerp Games. It was during the era when all equestrian sports in the Olympics had a military dominance. It has since been an artistic demonstration at both the Los Angeles Games in 1984 and the Atlanta Games of 1996. The American connection is no coincidence as Vaulting is increasing its numbers there. In the 1950s, Californian horsewoman Elizabeth Searle visited Europe and saw the potential of Vaulting for children in her local pony club. Searle co-founded the American Vaulting Association in the late 1960s with equine expert Jeff Moore. By the 1970s American vaulters participated in an international exchange with fellow vaulters in Stuttgart, Germany. Vaulting was first introduced to the inaugural WEG in Stockholm in 1990 and the first FEI World Cup™ Vaulting Final took place in 2011. As the video above shows, Germany's Simone Wiegele and Switzerland's Patric Looser were the first World Cup winners. Vaulting appeals as a recreational pursuit and educational stepping stone into equestrianism. For many, it’s the most accessible way to get involved. Vaulting offers therapeutic benefits, as well as a touch of sparkle on the world stage.